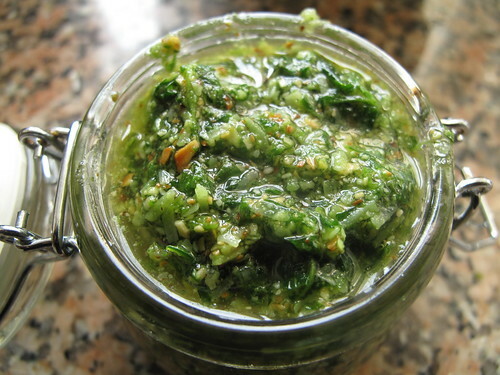 Pesto – meaning to pound or crush. 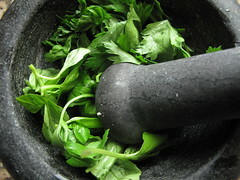 The contracted past participle of pestâ and the same Latin root as the English word pestle. 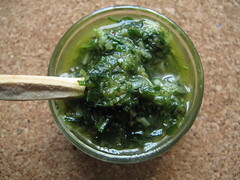 This classy sauce is made in Italy, loved the world over and has as many variations as there are edible green leaves. 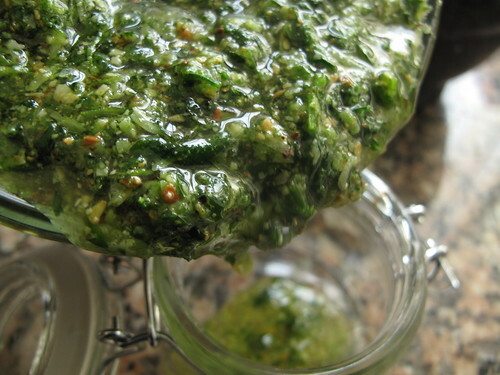 From Pistou to sun-dried tomato pesto and others made with Parsley, Radish leaves and even with peas, this is not a sauce you can forget about making. You have to it. 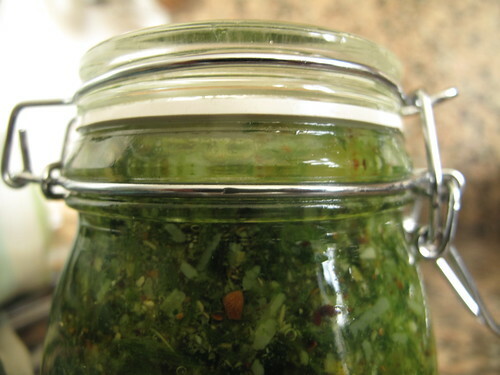 And if you love any of the store-bought stuff in jars….. think again. They don’t even come close to what you make at home – the colours of home-made are vibrant and intense; and the results – soft and chewy and fragrant. And all yours. 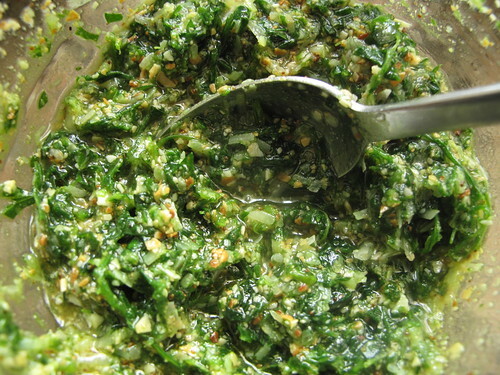 Basic Genovese pesto is the common sauce most people know. 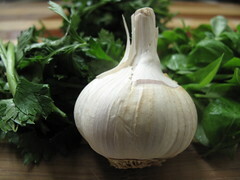 It is made from Basil, Garlic, Parmesan cheese and olive oil. All bashed and mixed together and that’s it. First I read the recipe 🙂 and then I decided how I want my version to taste. I’m not a pinenut lover, I don’t know why. 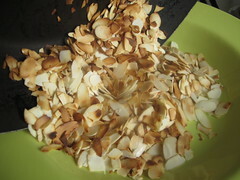 But talk about almonds and I’m there in a flash, any sort – blanched, whole, flaked, chopped, ground, I’m an Almond chic, any day anywhere. I always have a pack/bag somewhere in the house. 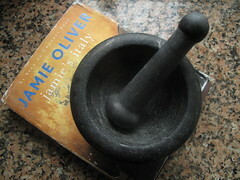 Anyway, out came my Ikea mortar and pestle and off to work I. 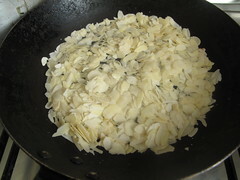 First of all, dry-fry a handful of flaked almonds in a frying pan. When the nuts are ready, out of the pan they come and unto a plate to cool down. 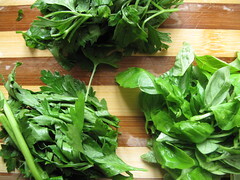 Then set out three handfuls of washed basil and parsley leaves (and some stalks) – going against tradition is allowed. (In my case, my basil plant had been subjected to numerous pluckings and needed recovery time. 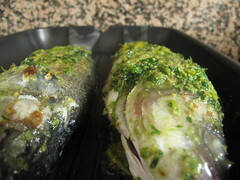 In the meantime, I had loads of Parsley and decided to use that as well). 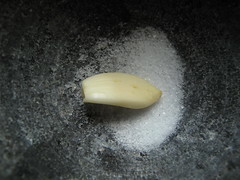 Into the mortar goes a clove of garlic and 1/4 of a teaspoon of salt and then the leaves on top. Proceed to pound it all together in the mortar or feel free to do it in a food processor…… which you’ll have to clean up :-). (I succeeded in creating mushy leaves and so forged ahead). When leaves are all bashed up, tip them out into a bowl and make progress. 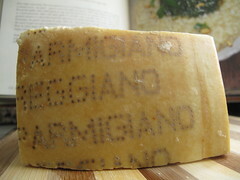 If you have some Parmigiano Reggiano (Parmesan cheese), by all means use it. 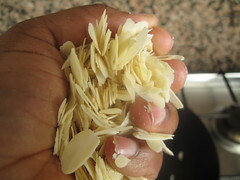 You need a handful of it, grated or about 50g. 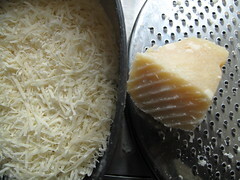 I have made this with soft grated cheese – Gouda to be precise….. for me, any sort of grated cheese would go. No need to be extremely purist I think. In this case, I was fortunate to have an Italian friend bring me a wedge from Rome some months ago – should be through with it by year’s end! 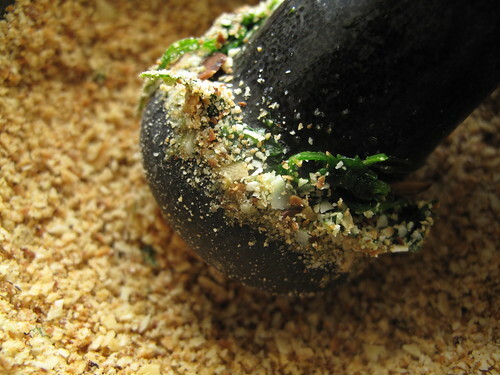 The Almonds go in the mortar and with a circular motion of the pestle, crush them….. to bits. And then it’s time to mix them all together and loosen with about 1/2 a cup of oil to start with. 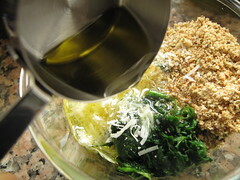 If using a food processor, you’ll need to drizzle the oil in and that’s one area you have to watch out for if you’re using extra virgin olive oil. Extra-virgin olive oil contains bitter tasting polyphenols coated by fatty acids, which prevent them from dispersing. 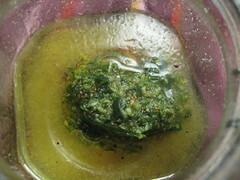 If the oil is emulsified in a food processor, these polyphenols get squeezed out and the liquid mix turns bitter ( as read here). I haven’t used it in my previous pestos but I suffered through the bitterness of minted pea puree so I understand the phenomenon all too well. So another thumbs up for making it by hand. Sorry Kitchen Aid … I don’t have one yet. As in a Kitchen Aid. I have a food processor but not the ‘Kitchen Aid’. Hmmm, time should repair all that. 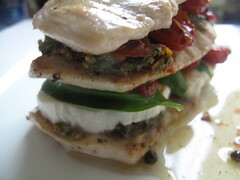 I used regular plain olive oil, others use Rapeseed/Grapeseed oil and still some use salad oils and the like. Go with what you know and like but preferably something along these lines. 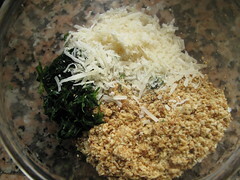 And moving on, put the crushed almonds and 1/3 of the grated cheese into the bowl with the leaves and drizzle in 1/4 cup of oil to start off with. 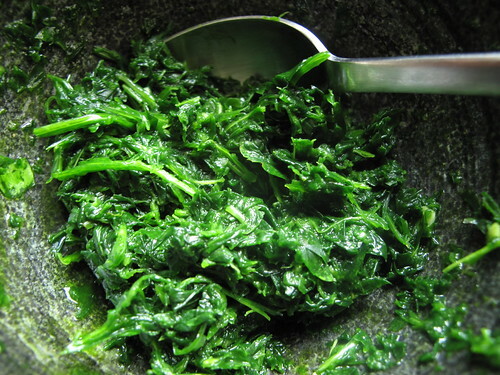 The carefully spoon it into a clean jar or bowl, don’t worry about sterilising since its not going into the store cupboard – only the fridge. You could also freeze it in cubes or tuck into it straight away. I’ll illustrate – you can have it as a dip with breadsticks, put a dollop on some pasta or in some vinagrette for your salad or add some chili pepper – fresh or dried and spread over fresh fish or chicken to bake, broil or steam, or in some soup or…… I could go on and on. You get the gist? Try it sometime.